Rental prices in California's Bay Area have been climbing at astounding rates over the past years. Recently, Marie Hatch, a 97-year-old woman, who had been reportedly assured by her landladies for decades that she's safe from the crushing hikes, was told otherwise. The new owner of the Burlingame house issued an eviction notice. 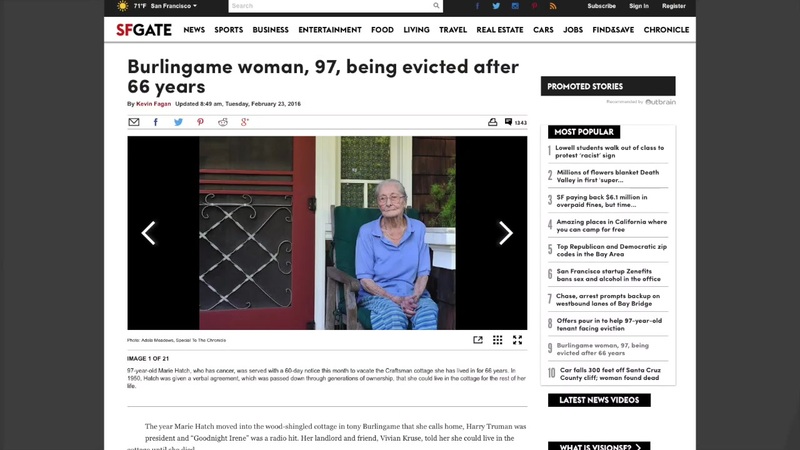 KPIX reports that when she moved into the home 66 years ago, friend and owner Vivian Kruse told her she could live there as long as she'd like. After passing down through the generations, the home is now in the hands of David Kantz, the husband of Vivian's deceased granddaughter. It is his position that as there is no physical record, he need not honor the agreement. A GoFundMe campaign has raised over $26,000 to help her financially if she is evicted.